ScoreMore is a sports tech startup at the convergence of sport, technology, entertainment and media. This mobile software solution hosted in the cloud transforms fan to fan engagement, all while generating incremental sponsorship and advertising revenue for teams, leagues and associations. Since October, I have been the Director of Business Development at ScoreMore, increasing brand awareness while setting up and participating in meetings with the Fortune 100, professional and college sports organizations, global technology companies, and investors. Last month, my colleagues attended the 2016 Fanalyse European Summit for Fan Engagement and Fan Experience at the Principality Stadium in Cardiff, Wales. At this inaugural international business of sport event they participated with talks regarding the need for more fan-to-fan technologies enabling fans to connect with each other as well as drive revenue through increased digital reach for teams, sponsors and advertisers. The Sports Techie community blog has played a major role over the past six years pioneering the industry enabling us to continue evolving the space together with ScoreMore’s purposeful enhancement of fan experiences through effective fan engagement. 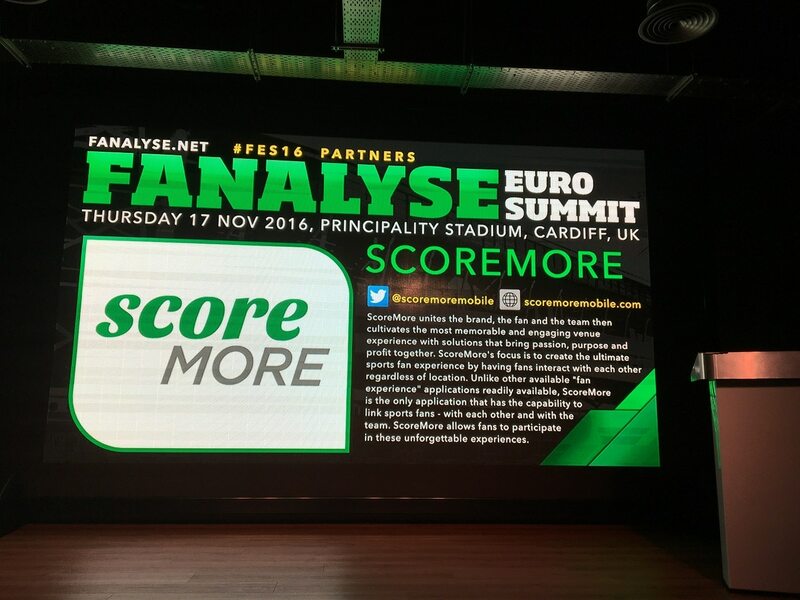 ScoreMore Defines Fan To Fan Engagement At Fanalyse European Summit – SportsTechie blog. ScoreMore’s unique sports marketing solutions are patent protected since 2014 providing a competitive edge no other company provides. Our digital fan engagement and sponsor driven assets are delivered to mobile devices inside and out of large sports and entertainment venues. ScoreMore is a certified Woman’s Business Enterprise (WBE) through the Women’s Business Enterprise National Council (WBENC) and is in alignment with the mission statements of nearly every sports organization to enhance fan engagement while offering interaction. Authentic Fan Engagement is best defined by ELICITING EMOTIONS and creating LIFE ALTERING experiences. Our mobile solution does not compromise live action rather it connects the in-game user to the cloud or existing apps by enabling management to bridge the gap to make fans truly feel a part of your team while strengthening the relationship with loyal fans. The fan’s time at your event must be the most awesome experience every time. In the absence of a championship, the fan experience is the ultimate measure of success. User data captured by ScoreMore is another key asset our partners will enjoy access to. The simple interface at FanFun is a robust source of end-user personal data. Geo-Fencing generated data also provides powerful consumer insights. ScoreMore’s innovative technology will transform the relationship with your fans and sponsors. ScoreMore is the ULTIMATE fan engagement solution. Your fan will forever be changed by their EXPERIENCE with the team. We GUARANTEE the fans something to take with them, even if it’s just a smile. AUCTION ADVENTURES – Your fan is energized to bid on their DREAM adventure while competing to win their distinctive ONCE IN A LIFETIME team experiences such as; a private jet ride with a favorite team to the next away game, VR and augmented reality gamification contests, singing, “Take Me Out to the Ball Game” at the 7th inning stretch or an unique cuisine dinner for 4 at a local restaurant, and much more. The auction items are limited only by your imagination. TEAM TRIVIA – Your fan becomes the TEAM EXPERT by answering random team/sport related trivia questions while earning reward points that can be redeemed for concession items, memorabilia or swag prizes during the live event. GEO LOCATION – Our geo-fencing technology makes it possible to offer ScoreMore fan engagement solutions to: Fans in stadium only, Fans tailgating around the stadium area or in sports bars, Fans at home, on the train, virtual, and really anywhere, at any time of the season or off-season. Proprietary Sponsor Advertising – The patented ScoreMore solution showcases each platinum team sponsor on the mobile phones of all one hundred thousand or twelve thousand fans attending the live event or concert as well as fans sitting at home watching on television. The unique full-screen rotating screen saver provides unparalleled advertising real-estate with each sponsor logo displayed during the entire event. The ScoreMore management team has a track record of creating and growing leading edge software technology ventures in addition to bringing Big 4 consulting expertise. Most notably was the formation of VINnet a Software as a Service travel and expense management company started in 1995, which revolutionized corporate shared service centers worldwide. The company was acquired by Concur Technologies and subsequently acquired by SAP for 8.3 Billion. Fanalyse curated the first ever European Summit in Cardiff, a top-class selection of speakers, moderators, industry leading delegates and partners from around the world discussed the latest challenges faced in the quest for creating authentic, intimate relationships with fans. More than 150 delegates heard keynote presentations and panel sessions with discussion and debate about the respect for and engagement of the dedicated fan and the overall quality for spectators. Access to leisure and sport is a fundamental human right as stated in the 1948 UN Universal Declaration of human rights. Sport has become a social phenomenon of the twenty-first century that mobilizes and excites people worldwide. Sports clubs and sporting events are tied to fan support, participation, and financial and emotional commitment. Social and economic spinoffs require international agencies and government, national and local authorities, as well as national governing bodies, tourist, commercial, and media interests, to support the declaration. Recognize and promote awareness of prompting excellence in developing fan engagement and enhancing the fan experience. Reaffirm the sport sectors collaboration commitment to work together in a synergistic and harmonious way to deliver benefits for the fan. Provide and share clear evidence based research and information, policy guidelines, technical support, and international best practice to advance understanding in these fields. Create adequate and responsible conditions for the development and enhancement of the fan experience. To encourage education and training, as well as special created capacity building programs to support and nurture the development of the fan experience. To collaborate and cooperate at the European level in order to fully develop the opportunities and potential of the sports industry to deliver an enhanced fan experience. To ensure the dialog and collaborative efforts are delivered beyond Europe. To increase collaboration and capacity of understanding between relevant organizations at every level in sport and tourism in order to become more effective and efficient to deliver these goals. To develop relationships with other sectors and interests in order to maximize the legacies of successfully delivering the fan experience. Participants in the Fanalyse event, wish to mobilize relevant and appropriate financial resources to strength the ability to maximize these goals. The Cardiff Declaration at the First European Summit was agreed to and adopted on November 17, 2017, at 5:20 p.m. The cloud-driven ability for a connected fan to interact with the team and other fans during the entire live game, match or concert, is true fan engagement. Fans are competitive by nature and yearn for some easily accessible technology that enables them to interact and compete with other like-minded loyal hometown fans and visitors alike. Winning bids like on eBay or earning free prizes and concessions are powerful incentives for enticing consistent fan engagement. Fan engagement is NOT fan experience apps that provide operational conveniences such as seat upgrades, parking assistance and food delivery. Fan Engagement is NOT consuming content, statistics, analytics, and video. While there are many so-called fan engagement apps and technologies with successful penetration into the sports marketplace, there is no emotional connection made with a seat upgrade. ScoreMore is a certified Woman’s Business Enterprise (WBE) through the Women’s Business Enterprise National Council (WBENC). Sports Techie, I found an immediate emotional connection with ScoreMore after doing my due diligence with Piazza and Founder, Pam Furey. Pam is a seasoned and proven entrepreneur based in Chicago. Her company vision is both spot on and contagious. What I am also finding out is there are some potential clients and partners that are not truly “getting” this fan engagement tool, as well as not jumping on board of this unique public relationship opportunity to work with a woman owned business in the sports industry. The latter is a rare occurrence if you did not know. Many Fortune 500 corporations and sports leagues are under fire for their business practices and hiring procedures towards women and minorities. Mobile applications are taking over fan engagement and ScoreMore has it covered like no other sports technology business in the U.S. and overseas. Besides traditional American sports, I have already contacted the UFC, WWE and top eSports organizations about our wares. Generation Z and millennials are target markets for ScoreMore because they love engaging with their phones all day, everyday. Season ticket holders can become weary of the same old gameday and matchday experiences making ScoreMore a welcomed new and complimentary asset. As long a a stadium, arena or venue has broadband or preferably Wi-Fi, ScoreMore is ready to integrate with client needs as a stand alone product, with API code or via a link in an existing team app. It you looking for white label look and feel, it can be easily accomplished. Purchase our product per event or as SAAS model, then be amazed how ScoreMore delivers an authentic fan engagement solution that sponsors will be delighted to participant with. Whether it is pre-game, during game or post-game, ScoreMore is true fan engagement. For more information please: email: info@scoremoremobile.com | or phone: 224-FAN-FUN1 | 224-326-3861.